Ruby W. Robinson was born on November 10, 1935 in Hazel Hurst, Mississippi, the daughter of William and Myrtle Robinson who preceded her in death. Ruby lived in Springfield, IL with her family. She worked as a school teacher and was also a foster grandparent. Ruby loved shopping on the home network website and being in the presence of family. 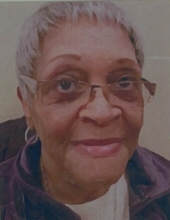 She leaves to cherish her loving memories, children; Jackie Dorsey of McKinney, Tx, Trina Jackson of Springfield, IL, Torrance Reed of Champaign, IL, Raynard Jackson of Flossmoor, IL, and Christopher (Dora)Reed of Lawrenceville, GA, her grandchildren; Natasha Briggs, Jeffery Briggs, Monique Weathers, Takeisha Weathers, Porcha Jackson, Ricky Hunt, Christopher Reed, Keenan Lindsey, Keon Lindsey, and Kendra Lindsey. Ruby also leaves to cherish her memories, 14 great-grandchildren, one sister; Willie Smith, two brothers; Ronald Robinson and Dewitt Robinson, and special friend; Antanet. Ruby was preceded in death by both of her parents and one brother; Alford Robinson. To send flowers or a remembrance gift to the family of Ruby W. Robinson, please visit our Tribute Store. "Email Address" would like to share the life celebration of Ruby W. Robinson. Click on the "link" to go to share a favorite memory or leave a condolence message for the family.